Add extra options to products which your customers can select from, when adding to the cart, with an optional fee for each extra option. Add-ons can be checkboxes, a select box, or custom text input. WooCommerce Product Add-Ons is a product configurator which allows your customers to personalize their products by adding input boxes, dropdowns, file uploads or checkboxes. Moreover, you can use the add-ons as a product designer and you can apply it to different products of your customers. For example, you can only have an add-on for a wide range of products, not for black shoes only. Furthermore, as a product designer, it does not have support for conditional logic. If you want your customers to fill out different fields based on information they fill out, we recommend that you use the powerful Gravity Forms plugin to create forms with conditional logic. Then you link those forms to your WooCommerce products with the Gravity Forms Product Add-Ons extension. 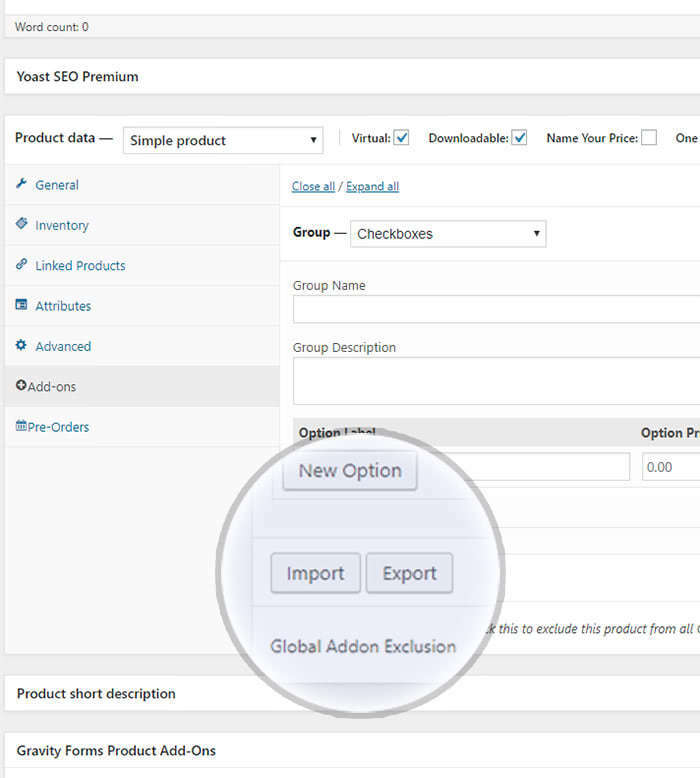 Choose to add add-ons globally or per-product within the edit product page. Import or export add-ons fields as serialized data. This feature is also available for the Global Product Add-Ons. Works great in particular for gift messages, donations, laser inscription and any other product that requires user input. Supports compulsory fields, text areas, checkboxes, radios, select boxes, custom price inputs and file upload boxes. You can add Add-ons worldwide or per-product from the edit product page, such as you can apply the plugin either to all of your products or to specific fields, built upon your choices. 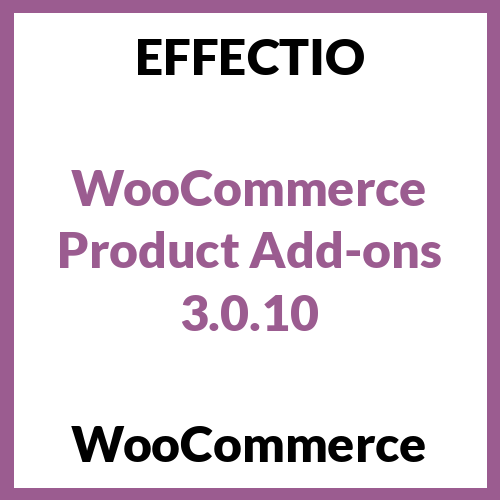 It works with the WooCommerce Subscriptions plugin to add pricing to your options for the repeated subscription. The name that you are giving to the add-on. It determines the order in which add-ons are displayed on the frontend. In other words, it determines which products will show the global add-on. 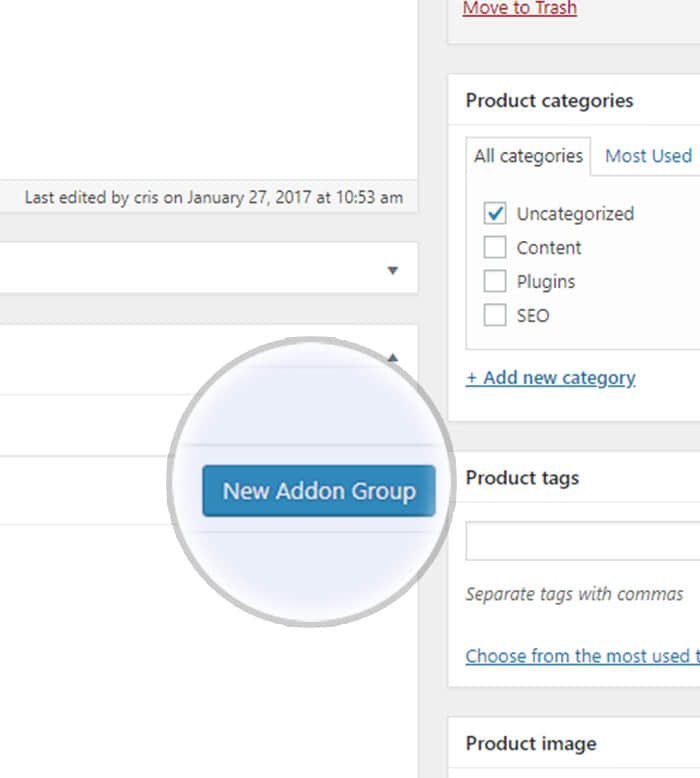 If you want to add your first add-on, you can click on the “New Add-on Group” button on your product settings. After that, you have to select a field type from the top-most select box. More choices are available here (for instance checkboxes, radio buttons, select box, custom input etc.). For instance, you can change the order in which the add-ons are displayed with drag and drop. More than this, add-ons can be exported and imported using the buttons when editing any type of add-on. In order to make the uploads hard to find, you can store them in randomized folders under wp-content/uploads/. Hence, people are allowed to browse your file/folder structure if some hosts enable directory listing. * Fix – Text field type addon is not accounting for multibyte characters. * Fix – Undefined error when variation data is not found. * Fix – Product totals not updated instantly when clicking up and down number input. * Fix – In Safari browser, validation not working when minimum set to 0. * Fix – Addon totals were displayed on top of options due to last version. * Tweak – Relocate addon fields to be after the variation description. * Fix – Tax inclusive display is not showing on addons in cart/checkout. * Fix – Product addons not applying to grouped products when using global addons. * Fix – Options total/grand total does not work with “Free” product. * Fix – Missing minified quickview.js. * Fix – When fields are not required and left empty, prevented add to cart from working. * Fix – Compatibility with Subscriptions title when addon is present. * Tweak – Compatibility with Composite Products. * Tweak – Clear addon fields when clear variations link is clicked. * Tweak – Using custom multiplier if zero is entered, don’t show addons in cart. * Update – POT file. * Remove – accounting.js file in favor of using the one that comes with WC core. * Tweak – Show the price display suffix on the grand total.